I have such a fun art secret to share! Not a secret, I guess, but something new to me that I loved so much. My friend Allison has some cool paintings at her house that I noticed. When I asked about them, she said, “Oh, those are by Steve Keene . . . do you want one?” How generous! Little did I know. Allison told me that Steve Keene is a Brooklyn artist (she knows him from his work in Charlottesville) who creates massive installations made up of hundreds of smaller paintings on plywood. His process is really interesting, but so is his philosophy: he wants visual art to be available for everyone, like buying a song for a dollar from iTunes. So when those installations are dismantled, the individual paintings can come live at your house! You pay $30 (plus $12 shipping) and he’ll send 5 or so medium paintings. 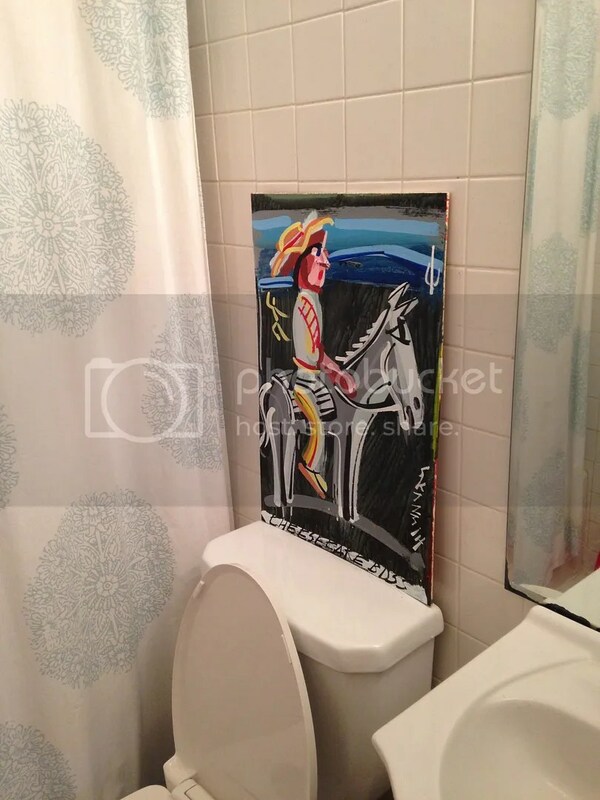 You don’t know what you’ll get, but you know it’s folk art and it’s likely colorful (possibly bizarre). Of course, I jumped on that opportunity pretty much immediately, and then had to wait awhile before our mystery paintings arrived in the mail. By the time the package arrived I’d become so curious and eager that I was Christmas-morning giddy as I ripped through the brown paper. And I was not disappointed. I’d emailed with Steve during the wait, so maybe because of that, maybe because of Allison, or maybe randomly, we got nine or ten paintings instead of the advertised four or five! Then I put on my insane art curator hat and ran around rearranging and trying things out on our walls. In the end, not a lot was rearranged. But the whole process, with the surprise element, not to mention the low cost, was such fun. I might be addicted. It was like Stitch Fix for art, except less expensive. 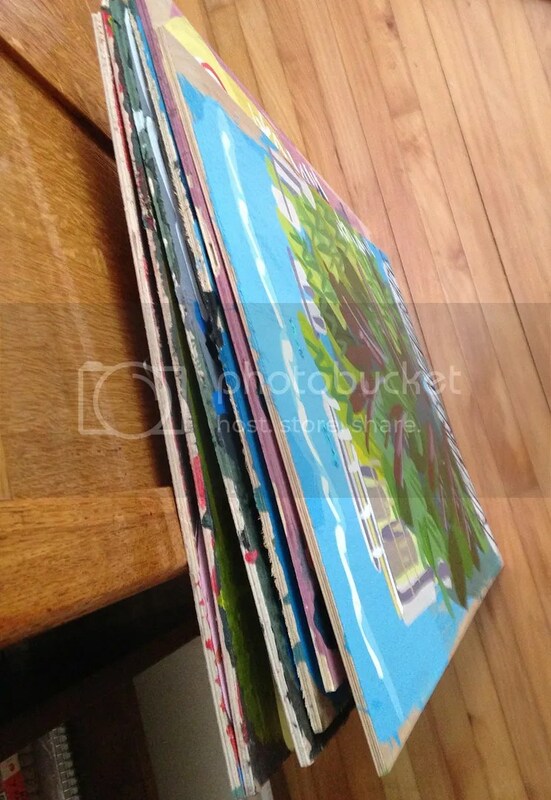 Think about it— five paintings for under $9 a piece, and in my case, $4.20 a piece! The low cost of it makes it so low risk, which I love. Don’t get me wrong: the paintings are awesome and might fit in timelessly with your collection, but if they’re not your speed, no biggie fry. 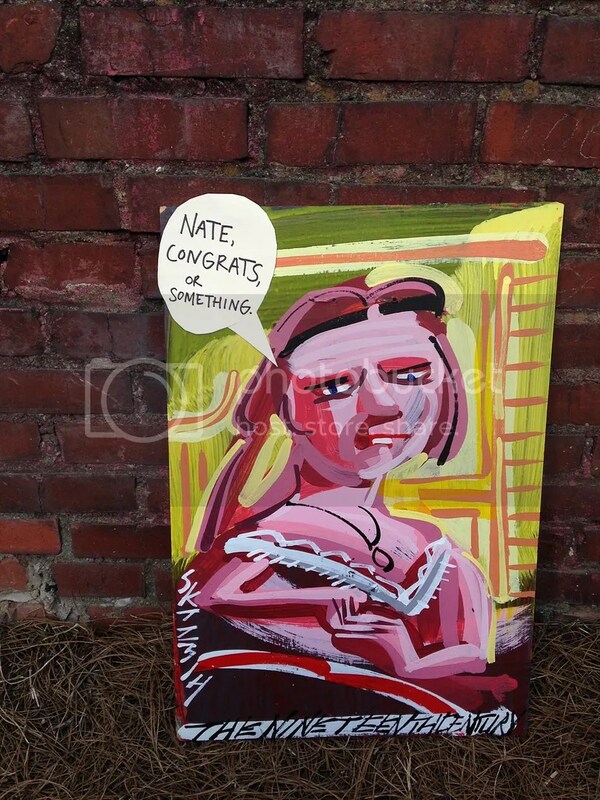 and the weirdest of the bunch made a perfect post-bar exam celebratory gift for my cousin Nate. I’m not sure how it happened along the way, but we’ve amassed a pretty fun art collection. Not super expensive collector pieces, but meaningful pieces that have some reason behind them like the colorful Memphis in May Music Festival poster, framed photographs from travels during college, this fruit painting (I love. Our most formal frame, in the kitchen. :) That’s why art is fun. My aunt and uncle gave it to us our first married Christmas.). Though I love what we have, I realized a few years ago that most stuff on our walls was framed behind glass—prints, photos, drawings—and that we should go for more texture to round things out—actual paint, fabric, more three-dimensional hangings. Then I visited one of my good friends who lived with her husband in Charlottesville at the time. They had a small rental house, and when I walked in I said, “Wow, this is really, like, a grown-up house.” I think she had inherited some formal side tables, and had generally nice coordinated furniture, but it was the art that did it for me. In the living room they’d hung a large abstract floral painting by an artist that her family really liked. She and her sisters had gotten a discount when all of them bought paintings at an arts festival. It was confirmed: I needed* paintings. But, two problems with original paintings: 1) They’re pricey (you have good taste, so anything you like is bound to be super expensive). Or, 2) You don’t have an artsy background, and maybe you like something and could buy it, but you’re worried: what if it goes out of style and you don’t like it later, or maybe it’s great by itself but just doesn’t work with everything else you’ve got going on, decor-wise. Why would you spend so much on something purely decorative (and possibly of questionable taste)? Art should be fun, expressive, not anxiety-inducing. This is why I love Steve Keene for giving me some honest to goodness paintings on my walls. If you like folk art, you should give this a try. Even if you don’t, there’s no risk involved. Give a painting to your pilates teacher, your farmer, or your favorite barista. Will you order some paintings?? Please report back if you do! Not sponsored. I love Steve Keene. *Wanted. But visuals affect me, and you, too, so the need argument could be made. 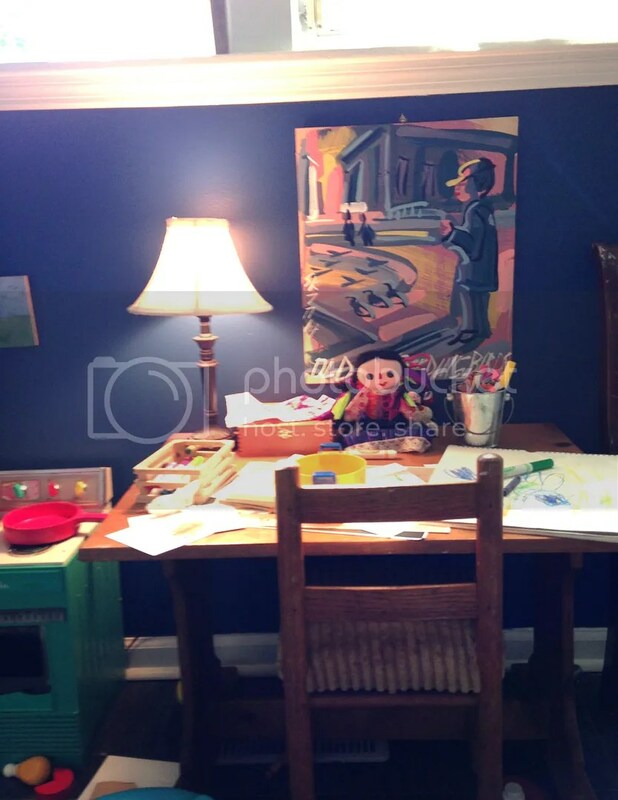 This entry was posted in art is fun, free advice, pinterest-worthy and tagged art, art collecting, Brooklyn, Charlottesville, folk art, painting, Steve Keene, Stitch Fix, surprises. Bookmark the permalink. YES!!!! Yes to Art, all kinds!!! Yes to the way you’re putting your home together!!! 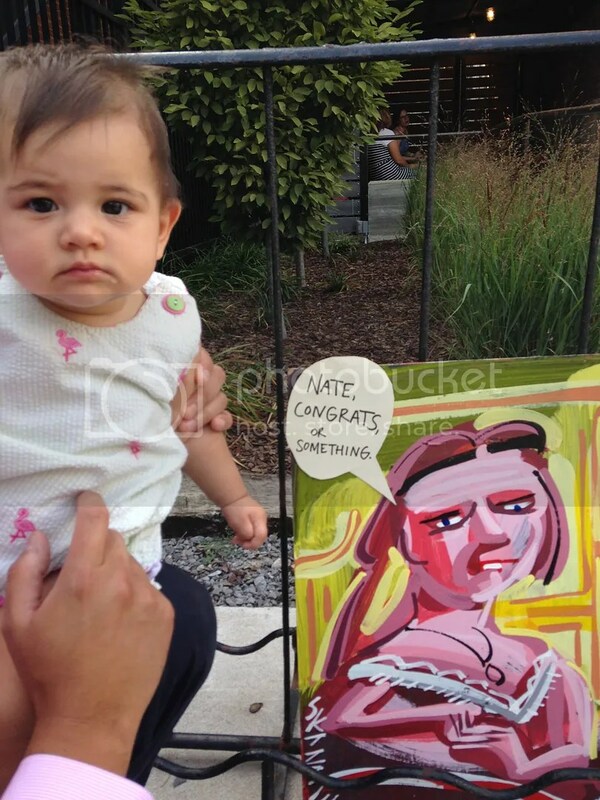 Yes to what you said about Nate’s gift ’cause HE LOVES THAT PIECE!!!!!!! Love your blog. Love YOU guys! Josie, friend… several thoughts from the several posts I read up on you tonight… first: “I love that smug feeling when I’m able to pull out that random dish, hat, book—whatever—to use at the perfect time.” Also, i like your style and artistic eye and would like your input on colors pink and little girl rooms… ! Steve Keene!! He is one of my favs too! Next time yall are in NY, you need to go to his studio/garage in BK. You get to pick whatever you want, and prices are even cheaper! It’s great!